The plastic dial cover was in quite good condition, so I was pleased to get this one. The lettering is printed on the front of the plastic, so most of them are usually scratched and worn. The only bad spot on this one is the "l" in "Electric". The cabinet is bare bakelite. The bronze-coloured grille is perforated metal, and I'm guessing it was anodized, since the bare metal is silvery-grey. It's right up there on the Christmas gift list, this great little radio. 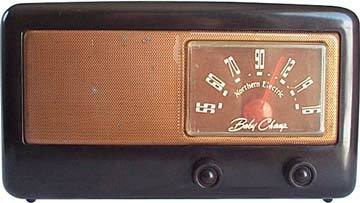 The Baby Champ, the Biggest Little Radio in the World. LISTEN to the Northern Electric Hour (Forward With Canada) every Monday Evening Trans-Canada Network. See your papers for time and station. As far as I can tell, the "tortoise brown" colour is the bare bakelite. All I've done so far is polish it up a bit and made sure it wasn't a fire hazard.